My relationship with the Nook e-reader has been love/hate, with slight leanings towards hate in recent months. The screen quality was nice and sharp. The illuminated color touch screen was a pleasant way to navigate the menus. It had WiFi and free 3G, which I used liberally to buy new e-books while traveling. Barnes & Noble had a shared Wish List on the device and on their web site, so no matter where I added a book to my Wish List, I could see and buy it from anywhere. The Nook had a web browser, audio capability (presumably for listening to music while reading), games, and more. It looked like the honeymoon would last forever. And then the problems started. It began with a strange ticking noise emanating from the Nook whenever it was plugged in for charging. Not only that, but during charging the device would get unusually warm. That's normal when a battery is being charged, but this was a few degrees above normal. A phone call to tech support confirmed my fears that there were reports of overheating batteries. They swapped my Nook out overnight and I was up and running once more. However, about a month later, the same monster reared its ugly head, and this time I took the Nook back to my local B&N store. The staff there--always friendly and helpful--immediately swapped my Nook out for a fresh one. But it was on the drive home that something tugged at my mind: I was really busy with a new project at work, and I was barely using the Nook as it was. After repeated problems with the device I decided to sell it. It took less than an hour to find a buyer on Craigslist. Ah, the joys of Internet commerce. Fast forward a year, to just last month. After enjoying my Kindle immensely, it occurred to me that I had about $100 worth of e-book purchases collecting digital dust on my B&N account--books I was very interested in reading now that I had the time. 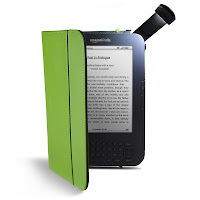 This dilemma revealed another ugly reality of e-readers: Digital Rights Management and proprietary e-book technologies. I couldn't simply download my Nook books to my Kindle; the technology doesn't work like that. If I wanted to read those Nook books, I was left with two choices: re-buy them on my Kindle... or just buy another Nook. Barnes & Noble had just released the Nook Simple Touch, a smaller, lighter Nook that forsook many of the features of its predecessor, but added a few more. The result was that prices on the Nook 1st Edition had dropped. But given my problems with the Nook 1st Edition, I was leery of buying another one, and preferred the updated tech that was part of the Nook Simple Touch. What to do? The decision didn't take long. 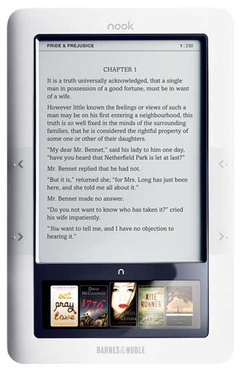 So is the Nook Simple Touch a great e-reader? How does it stack up to the Nook 1st Edition? or the Kindle with Special Offers? Which device do I prefer, and why? All will be revealed in the finale, Kindle vs Nook Part 3 - The Right Touch! About two months ago, I was privileged to get an Amazon Kindle e-reader for what basically amounted to free. 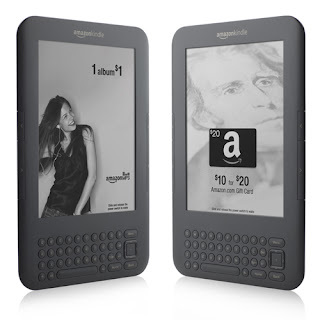 You see, Amazon has this nifty Kindle variant called Kindle with Special Offers . It has a slightly lower entry threshold than a regular Kindle --$114 vs $139--with the caveat that you get little advertisements on the screen. Other than that, it's the exact same device. The ads are only visible as a screen saver and within the menus (thankfully, they do not show up in your books while you're reading) so they're very unobtrusive. But the best part is that the "Special Offers" are for discounts and promotions that are only available if you own this particular Kindle. Why is this a good thing? Because most of the offers are awesome! Fifty percent off a $200 gadget is nothing to sneeze at, particularly if it's an electronic gadget I was literally about to buy anyway. So when a friend told me about that Special Offer back in May, the money I saved essentially paid for the Kindle, give or take $14. Since then I have more than made up for the cost of admission with this bad boy. Among others, there was the $20 Amazon gift card for $10, a $1 MP3 album, the $10 off any video game, the free Amazon HD movie rental ($5 value), and another offer that amounted to buying 1 e-book and getting 2 free. Granted, some deals (like "get $30 off a Kindle leather case with built-in reading light") are only good because, well, I now have a Kindle. But for the most part, many of the deals have been on stuff my wife and I would be buying regardless. It's like having a digital coupon book, and we all know that frugal is the new chic. light that is perfect for bedtime reading. As an e-reader, I'm really impressed with the Kindle. It's light-weight, has a wonderfully crisp screen, and is fast and responsive. The case I bought with the built-in light is also great, because one thing I loathed about my Barnes & Noble Nook was the very ugly and unwieldy clip-on light accessory. So reading in bed next to my wife at night is no longer frustrating. The Kindle is also exceptionally comfortable in my hands, both in size and weight. This gives it a glove-like fit I just can't seem to achieve with the iPad or Nook, and it's probably the reason why, in just a month and a half, I've read 3 rather lengthy books on my Kindle--it's just a pleasure to use. Amazon seems to have found a nifty niche here by creating discounts and incentives--good ones!--on their own site, and with various corporate sponsors, in order to subsidize the Kindle's entry price. If the ads were all lousy and the offers pathetic, I obviously wouldn't be so enthusiastic. But they're not--they really are a good mix designed to appeal to folks who are inclined to adopt this type of technology already. That could be me, you, your grandma, or your kids. It's very simple to use, and I often find myself checking the Special Offers page just to see if any useful new gems have popped up. I've also heard that Amazon will start to expand and customize the Special Offer experience to make it even more attractive. I almost feel bad for folks who bought a regular Kindle, as they aren't eligible for these little perks. In short: the Kindle with Special Offers is the colloquial bomb. If you've been wanting an e-reader, this might be the one for you. "But wait!" you say. "Didn't Barnes & Noble just release a cool new Nook with a touch screen? Is it better than the Kindle?" Why yes, yes they did. And as a not-always-happy owner of a 1st generation Nook e-reader, I was keen to try out the new Nook Touch to see how it compared to its predecessor, and the Kindle. But that is a story for another post. Check back soon for Kindle vs Nook Part 2 - Dead E-Readers Tell No Tales!